If you are interested in becoming an umpire for the Aurora King Baseball Association, please be sure to read all the information on this page as most of your questions will be answered. If you still require additional information, please contact the Umpire-in-Chief. If the coach calls the game at the diamond or if the plate umpire calls the game (the plate umpire has control of the game as soon as there is a plate meeting). You will receive from the HOME coach a pay voucher. The AKBA will pay you by cheque. You do not get paid if the game is cancelled before game time. You must go to the 2nd game of a double header if you are scheduled, even if the first one is cancelled, unless you by the AKBA official. Umpires are to arrive NO LATER than 20 minutes before game time. Keep the players and coaches hustling on and off the field between innings. The umpire has control of the game. Do not hesitate to speak loud and clear to the coaches to ensure a smooth & consistent game pace is maintained at all times. A 15-minute grace period is given before the game can be declared a forfeit. Time however, is not added to the end of the game, it just cuts into the game itself. If both teams wish to remain for a scrimmage, suggest a coach can umpire behind the mound. Umpires are not required to umpire a forfeited game (due to transportation it is their discretion to do so). It is recommended that you do stay if the teams wish to play and “share” players for practice purposes. If you are unable to make a game due to an unexpected emergency situation, please find another umpire of the same level or higher to replace you. It must be an umpire that is registered with the AKBA Umpire Database. Contact the AKBA scheduler to inform of any change so the master schedule is updated and an appropriate replacement is secured.If you do not show up to a game without any communication, you will be contacted by the Umpire-in-Chief and receive a warning of potential removal from future commitments. The Head Coach will be contacting the Umpiring scheduler immediately of the absence of an umpire. Please note that for a Rep game that the Aurora/King team may lose to the visitors if two (2) umpires do not show. 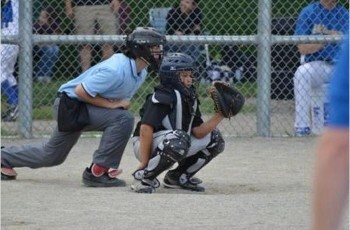 OBA recommends that two (2) umpires be present for all Rep games.